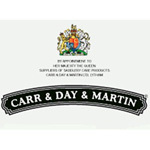 Carr & Day & Martin is the UK's oldest company involved in the manufacture of horse care products. We have held a Royal Warrant since the reign of King George IV and as market leaders are dedicated to producing premium products that provide a complete care programme for our customers. Carr & Day & Martin products are supplied exclusively through a network of authorized equestrian retailers in the UK and 29 other countries worldwide. Steeped in history, the comprehensive range encompasses four distinct care categories: Leather - Coat - Hoof and Health Care which provide a "one-stop shop" for the discerning horse owner be they a "happy hacker" or the professional rider.